Daenerys Targaryen, the last noble of her house, is on a path to reclaim her destiny in HBO’s adaptation of Game of Thrones. She has emerged as one of the series best loved characters. 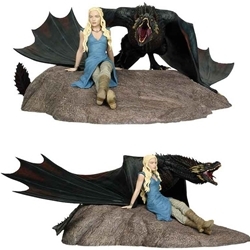 This Statue is an iconic moment of her resting with her dragon Drogon to create as an elaborately detailed prepainted limited edition statue.